In our podcast Emil Amok’s Takeout, I list off the key points about Travel Ban 2.0. Six out of the seven original countries are involved: Iran, Libya, Somalia, Sudan, Syria, and Yemen. Only extensive lobbying got Iraq taken off. The new executive order also suspends the refugee program for 120 days, limits the number of refugees in 2017 to 50,000, and does not single out Syrians. No matter how you slice it, the travel ban is still a Muslim ban, which raises constitutional questions. One aspect of the ban I’ve found rarely reported is in Section 11. “Transparency and Data Collection” sounds benign. But not when its intent is to provide the country with what essentially is a national scoreboard on terrorism. It’s going to be the unofficial official Muslim Report Card. According to the executive order itself, information will be gathered on the number of foreign nationals in the U.S. charged or convicted of terrorism; or removed based on terrorism-related activity. These aren’t travelers, mind you. They are people in our communities the government wants tracked. Oh, that would be Jeff Sessions. He’ll have so much time on his hands since he’s recused himself on any Trump Russia matters. And all this is in something called a travel ban? Sounds like they’re gearing up for a Muslim Ban 3.0 that will last longer than 90 days (120 days for refugees). If they have data, and everyone loves data these days, you can justify banning just about anyone in Trump’s America for as long as Steve Bannon wants. Forever? 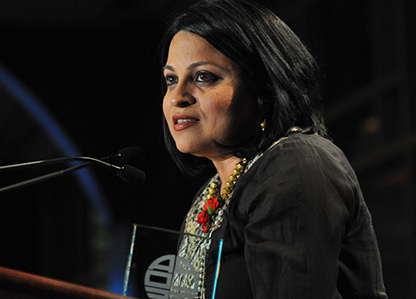 On the podcast, I talk to Deepa Iyer, South Asian American community leader and recent recipient of the AALDEF Justice in Action Award. She says the immigrant community is “already living in fear,” and denounces the ban that fans Trump’s xenophobic bent. We also talk about the killing of an Indian American engineer in Olathe, how Trump handled it, and how it is connected to the political rhetoric of our times. Listen to the podcast here. Or on the player below.